After an eventful visit to Monteverde, we got a transfer to La Fortuna to see Arenal Volcano. 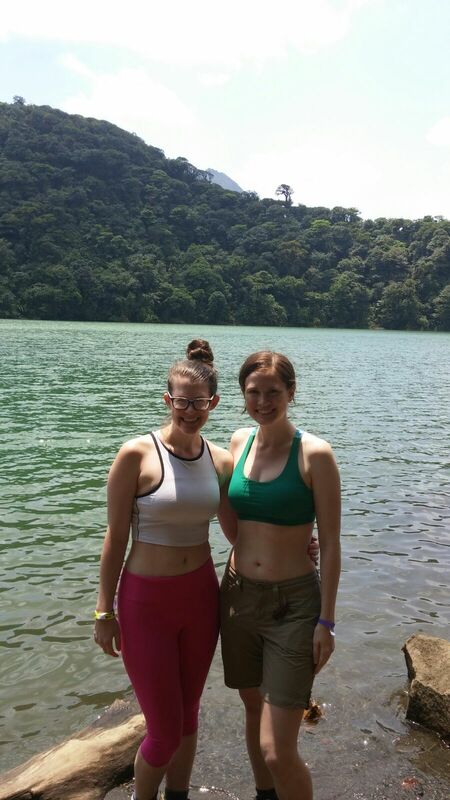 The transfer included a 1.5 hour bus ride, followed by a 1 hour boat trip across Lake Arenal. It was an incredibly scenic trip! 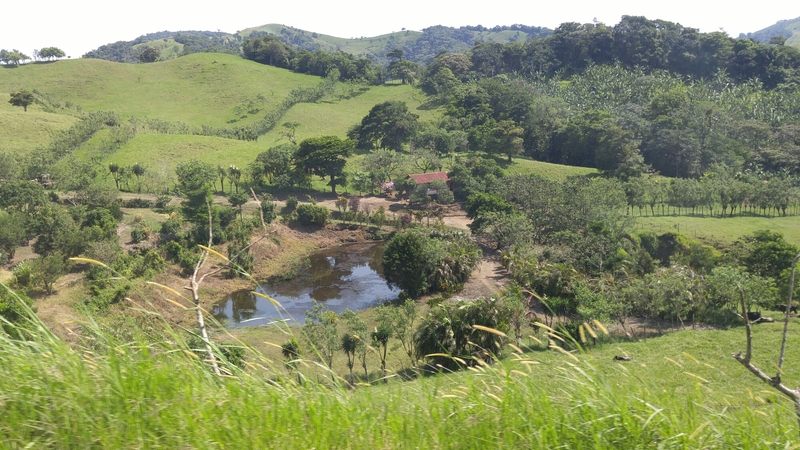 We quickly left the rolling, forested hills of Monteverde and traveled through valleys and fields on our way to the lake. It was a perfect, clear day, and we were all thrilled when the volcano appeared on the horizon. It was a little chilly in Monteverde due to the high altitude, but the heat returned in full force in Arenal. In La Fortuna we stayed in the fanciest hostel of my backpacking experience. 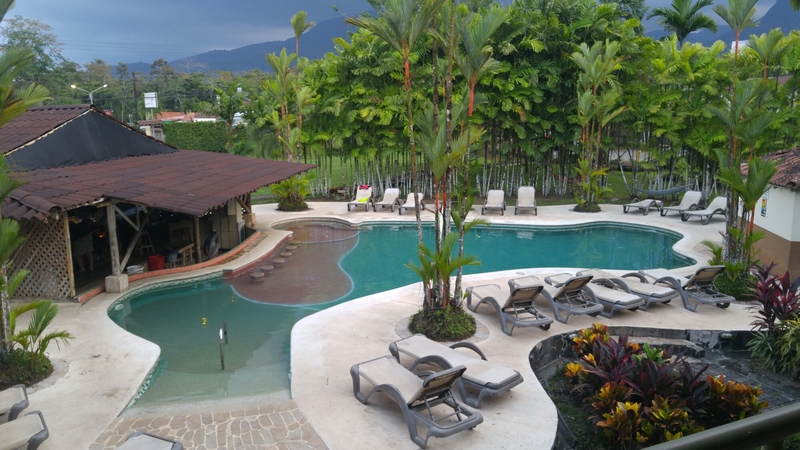 It’s called Arenal Backpackers Resort, and it is definitely more resort than hostel. The resort has a huge pool and bar, with tons of hammocks spread out around the property. The pool was glorious after a long hot day in the sun! 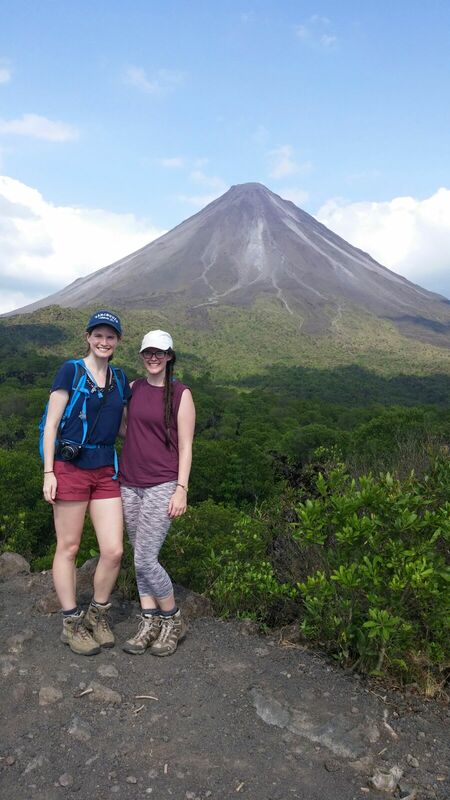 On our first day in La Fortuna, we visited the National Park for the volcano. 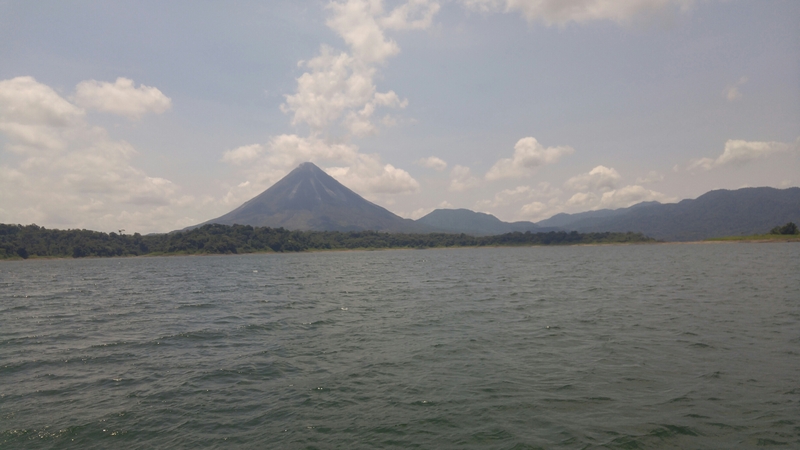 Arenal is now a dormant volcano, but it’s only become inactive in recent years and once upon a time tourists flocked to the area to see the sparks regularly flaring at the top of the volcano. Interestingly, the side of the volcano facing the town is still completely forested, it’s only on the far side that you can see the lava flows from previous eruptions. There were two primary eruptions in 1968 and 1992, both of which you can visit. We decided to do a two hour hike of the 1968 lava flows. The hike goes around a small lagoon that was created in a crater from the eruption. Its quite peaceful now and a huge bird habitat. 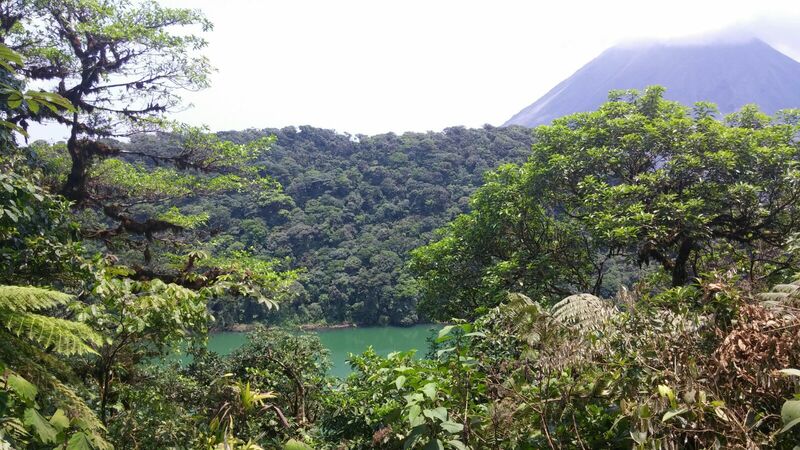 From there we hiked up through the old lava flows to a viewpoint that looked up at the volcano and out over Lake Arenal. 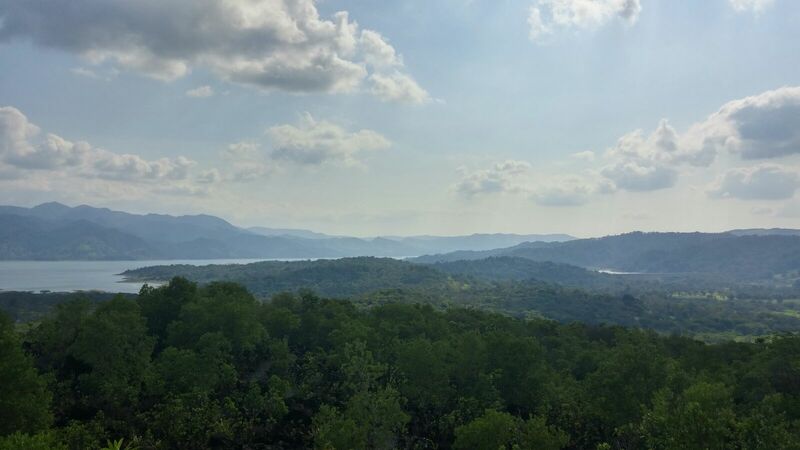 Like Monteverde, the park was surprisingly empty, so we had a great time learning about the volcano and looking out at the beautiful surrounding landscape! May is shoulder season in Costa Rica, so there are a lot less tourists around than usual, but I swear half of the travellers here are Canadian! We’ve met a lot of Canadians in our few days here. Our hostel had a board to write where you’re from and Canada made up a huge section, with almost every province represented. We met two girls from Toronto on the bus who were celebrating the completion of their medical degrees and decided to go hiking together on our second day. The volcano is still too dangerous for hiking, but there is a second, much older volcano right next to Arenal that is popular for hiking. The hike is called Cerro Chato – it goes up the side of the volcano and then descends steeply into the green lagoon that was formed in the center of the crater. There were many warnings that Cerro Chato is a strenuous hike and they were definitely well placed. The hike ascends steeply into the jungle and has many technical sections as the trail navigates around trees and roots. From the top there is an awesome view of Arenal and you’re able to catch a small glimpse of the green waters of the lagoon in the crater. Here the trail drops very steeply into the crater and was definitely the most challenging part of the hike. It’s a near vertical climb down to the lagoon and we were all sufficiently covered in mud by the time we made it to the bottom! The scenery is incredible though and it was well worth it to finally reach the bottom and swim out into the lagoon to clean off. There’s a little beach area, so we spent an hour at the bottom, enjoying the view and eating lunch before heading back out of the crater and down the volcano. We had a few snake sightings along the way. We were able to identify the first snake as venomous (although I can’t remember the name of it now – it was red, black and yellow). The second snake was a small green snake, but he was poised in the middle of the path with his head raised as if ready to strike something (we don’t think it was us though). He looked pretty foreboding and we decided to wait him out, but after 10 minutes he still hadn’t moved. We tested the water by throwing a few rocks in his vicinity, but with no reaction to this either, we decided to slowly pass him and fortunately we all escaped unscathed! He started to move off after we passed him, so he likely wasn’t much of a threat. 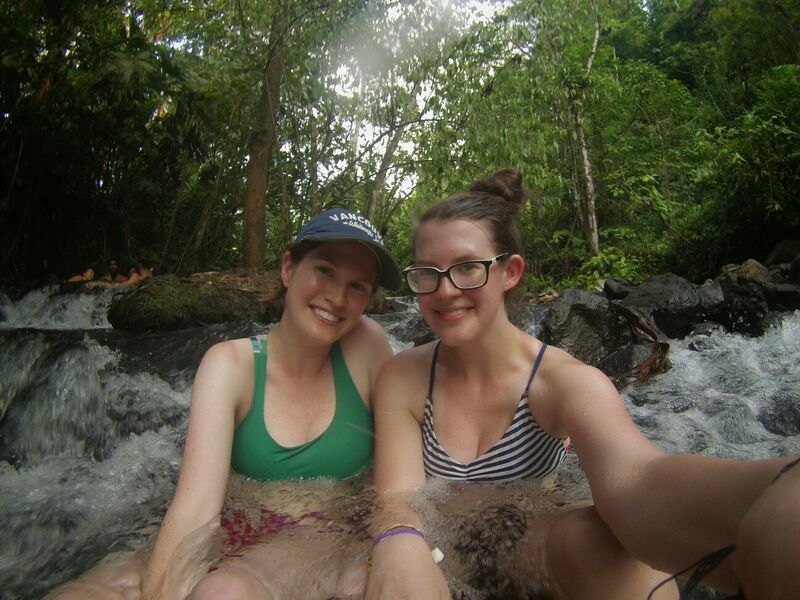 To finish a pretty much perfect day we stopped for beers from an enterprising local halfway down the volcano and then hit up some of the natural hot springs in the area to relax our weary muscles! The area is practically swimming with commercial hot springs, all of which are incredibly fancy and have a pretty large price tag attached. We got a tip about the free public hot springs and decided to save money and visit there instead. I’ve never been to a totally 100% natural hot spring before and I didn’t realize it’s basically just a hot river. There were tons of little pools that had been created and some small falls from the rapids. It was nothing too fancy, but super nice after hiking! At the hot springs we met two more canadians who had just graduated engineering and were surprised to discover we all had mutual connections! So it’s a big country, but a small world! If the red black and yellow were in alternating bands, then I believe it would probably be a coral snake? They’re pretty distinctive, from what I understand. Where were the other engineers from? Actually, I just googled it and there are some nonvenomous snakes that have a similar colouration. Apparently if the yellow band touches both the black and red bands, then it’s a coral snake; however, if the yellow (or white) is touching two black bands, then it’s one of a few nonvenomous mimic species. Of course, it’s safest to just keep your distance regardless. Very interesting” You both looked Beautiful………. Snakes just sound scary to me regardless. The view looks amazing though!